We’re very happy to introduce a new local history column by Bob Grainger. Bob is a retired federal public servant who discovered an interest in local history. KT readers may already know him through his book, Early days in Westboro Beach – Images and Reflections. He’s also part of the Woodroffe North history project and is currently working on the history of Champlain Park and Ottawa West. Welcome aboard Bob! On a good day in the summer of 2013, the beach at Westboro attracts scores, if not hundreds of people. But in the past, in the 1920s, 30s and 40s, the beach attracted great crowds as well, and on a year-round basis. In the 1920s, the local residents got together and constructed an open-air dance platform using materials that were salvaged from the shoreline. This dance platform was the centre of many festive occasions in the good summer weather. The 1930s saw the arrival of Sam Ford, a local resident who saw great commercial potential in the beach, and he started to buy the six lots that made up the beach area. His first project was to build his house – on the rise of land on your right hand side as you emerge from under the Parkway on your way to the water. On the left-hand side, on what is now a grassy slope much beloved of sun worshippers, Sam built the Trocadero Dance Hall on the same site as open-air dance platform. Sam knew that two things were important to the dancers of that era – a good floor, with a bit of “give” and “bounce” – and good music. The Trocadero supplied both in spades. 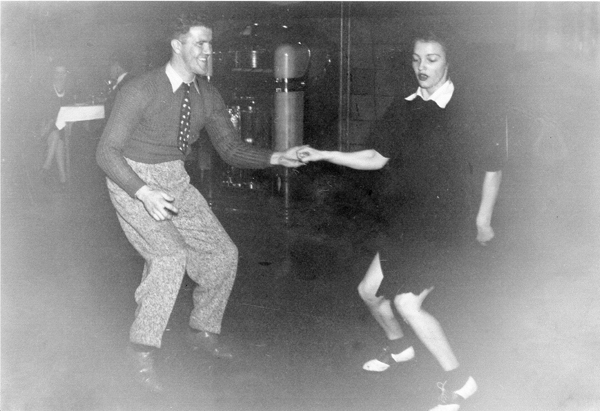 Oscar “Chin” Crete and Betsy Dubue dancing in the Trocadero, circa 1940. (Notice the jukebox in the background, although it might be hard to see given the age of this photograph.) Photo courtesy of Louis Diriger. Dancers paid an entrance fee to get in to the Trocadero and then someone had to feed the jukebox. Those who had no money would wait for someone else to pay. With the good floor and the good music, the Trocadero did quite well, particularly on Sundays when the dance halls inside the Ottawa city limits were required to close; the Trocadero, being in Nepean Township at the time, could stay open. There were Saturday night dance parties all year round, even in the cold of winter. On the weekends, especially in the summer, a local group of musicians would provide live music. Dance contests were a common feature of the weekends, offering a chance for the really good dancers to demonstrate their skills. Usually, the dance contest would consist of three different dances – the foxtrot, the waltz and the jitterbug. The winner would be decided by the applause of the crowd. With the end of the war in 1945, the Federal District Commission (the forerunner to the National Capital Commission) re-started its plans for a network of parkways around the city. The properties along the shore of the Ottawa River, including Sam Ford’s home, his three rental cottages and the Trocadero, were scheduled for expropriation and demolition to make room for the Ottawa River Parkway. Sam Ford’s property was originally appraised in early 1948, with the evaluators noting that: “the Buildings were apparently erected by amateur builders.” Negotiations continued over many months, but the end was inevitable. Sam agreed to a price in 1951. The three cottages were rented for another half-dozen years (because of the post-war housing shortage); the Trocadero was abandoned by all but local youngsters and finally demolished in early 1957. It was an ignominious ending for a facility that had brought so much life to the community. Do you have memories of the Troc? Or a related photo or story to share? We’d love to hear about it. Send your emails to stories@kitchissippi.com.